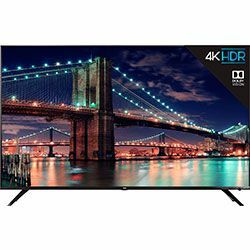 I managed to compare the TCL 55R617 vs TCL 55S405 because these devices seemed to be similar. Such a collation allows me to see that they have different functional directions and belong to various series. The first TV (2018) is a part of an R6 series, which is supplemented by the voice remote and Dolby Vision HDR. The second one (2017) is cheaper and is regarded as an S405 series representative. Such products line has lots of plugs and access to many streaming channels. The TCL 55R617 has a great resolution: 3840 x 2160 for a full screen. That is amazing for gaming process because the picture becomes not blurry but clear and bright. Perhaps, the reason is in a screen type (VA versus LCD), but the 55S405’s picture is worse. I tested the lower color brightness and noticed pixels on the screen on closer inspection. It’s hard to see at least 1 pixel on the 55R617. The TCL 55S405 vs TCL 55R617 collation allows seeing the difference between speed processing. The first device performs all the commands more slowly than the second one. They also sound the equally well. One more difference is the set of streaming services. The older 55S405 has much more entertainment sources than new 55R617. Moreover, all of them work great, without pauses, black screen, and video-audio desynchronization. The Amazon video doesn’t work correctly on the 55R617. The sound automatically increases and then decreases to the lowest level. 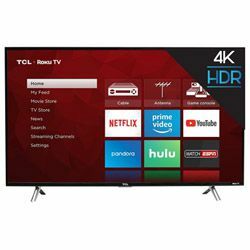 The TCL 55R617 has a very mediocre remote design. I can mute or change the volume accidentally just while picking up the controller. The 55S405’s volume buttons on the remote’s side are much better. They are distinguished and not very easy to push. Both TVs look gorgeous. The 55R617 has enough space for routing cables through its legs. The 55S405 also has stands, but they are too high, so it may not fit all the specialized shelves. The tactility of the remote’s buttons is amazing. Viewing angles are good. The picture changes a little bit and it doesn’t influence badly on the image perception. The panel looks low-quality. There is blotching in the corner. HDMI-CEC doesn’t work with my PS4. There is a lot of 4K streaming content. The TV doesn’t get warm while working. I need to subscribe to the Roku account before using the TV. I don’t want it really. The Roku menu looks very raw. It seems like it’s rendered at 1080p and even logos have a strange appearance.